Rio De Janeiro, Brazil (CNN) -- Brazilian President Luiz Inacio Lula da Silva met Tuesday with his emergency Cabinet as flooding in two northeastern states killed at least 42 people and left more than 115,000 homeless or displaced, the Agencia Brasil state news agency and civil defense officials reported. In Pernambuco state, 53 cities have declared a state of emergency, the nation's civil defense agency said. Thirteen people are dead and more than 42,000 are homeless there, the agency said. 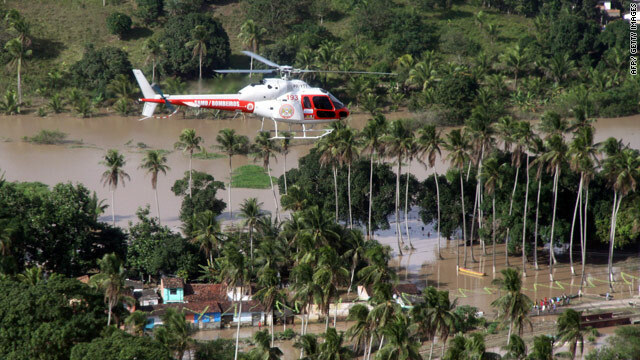 In Alagoas state, 22 cities have declared an emergency. At least 29 people are dead, officials said. More than 73,000 residents are homeless or displaced, the national civil defense said. More than 600 people have been reported missing in Alagoas. Defense Minister Nelson Jobim traveled to Alagoas and Pernambuco to see the emergency measures that have been taken, Agencia Brasil said. Those measures include the construction of field hospitals. Aid workers will provide shelters, food water and power, while health officials will offer medicine and treatment at hospitals. Pernambuco Governor Eduardo Campos -- who flew over the affected areas Monday -- described the situation as "heart-breaking." "What we have seen since Friday is more than a horror film," Campos said in a statement. Alagoas Governor Teotonio Vilela Filho traveled through several affected areas Monday to try to reassure residents. "I ask you all to remain calm because we are all invested in helping you," he said. Both governors also met with Lula, who promised to facilitate emergency funds to help victims. Alagoas weather officials forecast more rain for Tuesday. Brazil's Center for Climatic Studies predicted rain above average in the northeast for autumn, which has come to an end. Brazil's winter officially began June 21.